From small carpentry repairs to bespoke furniture designs - book Fantastically skilled carpenters anytime! There’s a team of professional carpenters in London who can build you bespoke furniture of superb quality. You can furnish your home or workplace with unique units made specially for you. Also, we are able to help you with simple woodwork repairs. The carpenters will consult with you in order to understand exactly what you are after. Then they will get to work - taking measurements, designing, and eventually building your new furniture that will fit your place perfectly. But they can also help you with even the smallest of carpentry tasks. The carpenters have extensive professional experience, and work with dedication and attention to detail. They will also have your specific requirements in mind when making your furniture. The result is top-notch, genuine custom-made woodwork that will enhance your home. Usually, the materials used are MDF or solid wood. We wanted to make sure that everybody is happy with our fantastic handyman services – both you and the carpenters who are handling the work. Price quote is given after an onsite visit, having in mind all your ideas and requirements. It would be best if you send us photos of the place where the new unit will be placed as well as your choice of materials (MDF or Solid Wood). This way we’ll be able to give you a preliminary quote for the project. If you are happy with the offer, then we can send a carpenter to your place for a survey and confirmation of the final price for the job. 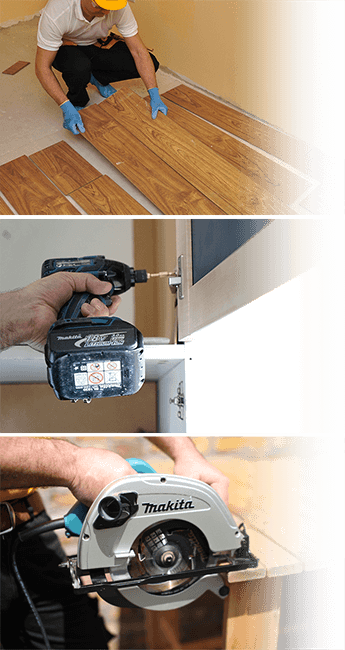 From the simplest tasks like door trimming or filling cracks in wooden floors and repairing other types of woodwork, to building beautiful long-lasting furniture for your home or workplace. You can trust the remarkable carpenters with every job and expect brilliant results. Are you ready for your custom made furniture? Then you can give us a call today and our friendly customer care staff will answer all your questions. In addition, you can reach us by using the online contact form. Just drop a few lines and we’ll contact at a time that is convenient for you.